Whenever I tell people that I run marathons they normally respond with one of three words: crazy, nuts, or insane. It’s been nearly 11 months since I last crossed the finish line of a marathon, but here I am once again staring down the barrel of 26.2 miles. A journey that will not only take me through the streets of Chicago, but a journey that will once again push my body and mind to see what I’m made of; to see if I have enough determination, fight, and grit to overcome the challenges of the marathon and complete what only 0.5 percent of the US population will ever do; to see if I can mentally, physically, and emotionally sustain the demands of moving my legs for 3.5-4 hours. Just like life, the marathon is a roller coaster. There will be ups and downs and highs and lows. I will feel great at times and awful at other times. I will smile and I will cry. To some of you this may seem crazy – this may seem like something only people who are nuts or insane do. But to me, the marathon is so much more. For some, it’s to pursue a dream, or cross something off the bucket list, or to prove to themselves they still “got it.” For me, the marathon is a celebration. 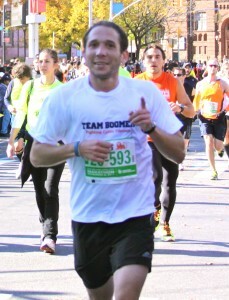 For a long time, I had a hard time finding one word to describe what the marathon means to me. I had all the feelings, all the emotions and all the intangibles, but I couldn’t find one word to sum it all up. Last weekend I had the opportunity to see a friend of mine, Jerry Cahill, speak and he used the word “celebration” when describing what it was like to run and finish a 10K just 3 months after receiving a new pair of lungs. After thinking about it for a few days I realized the word he uses is perfect. You see, for a young man who has Cystic Fibrosis, a chronic, progressive lung disease, that’s exactly what the marathon is. It’s a celebration – a celebration that at the age of 28 my lungs still work. A celebration that my lungs are still strong enough to carry me 26.2 miles. A celebration of how hard I work. A celebration that I continue to not only beat, but crush the odds. And if celebrating life or the fact that my lungs are still this strong by running marathons makes me crazy, nuts or insane, then yes, I am crazy. I am nuts. I am insane. We all celebrate life in different ways. This is how I celebrate.